I’M GOING to be talking a lot about pens in the next paragraphs, so you might think of turning away if they hold no interest for you, but this is really about collecting and purchasing decisions as a whole, and could just as well apply to cars, watches, Star Wars figurines, and whatever else people hoard in their inner sanctums. If you’ve been bitten by the collecting bug, do read on. Dr. Jonathon Deans is an Australian economist who specializes in the study of energy and commodity markets, and who teaches economics at the University of Newcastle. 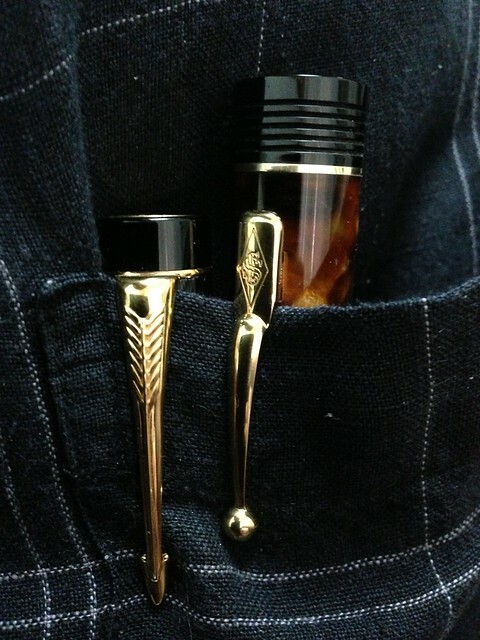 But away from his day job, Jonathon pursues a hobby with equal passion: collecting fountain pens. And unlike most of his fellow stylophiles (the fancy word for the addiction) who simply chase after and gloat over their inky toys, Dr. Deans has managed to merge his two interests by running a highly regarded blog on “Pen Economics” (www.peneconomics.com), tracking and discussing the vicissitudes of the global market for writing instruments. Jonathon explained that central to the economics of the matter is the idea of price vs. value, and where value (how strongly we desire the product) exceeds price, a purchase will likely be made. I listened with great interest and some amusement to his observation that many buyers of modern pens are risk-averse. He admitted that he was one such person himself, and noted further that he valued a close relationship with his favorite pen dealer—even at the cost of paying a certain premium over regular prices—because of the many benefits afforded by such relationships, chiefly personalized service and unparalleled solicitude. I couldn’t agree more with Jonathon (who gave a brilliantly comprehensive and insightful overview of the global fountain pen industry and particularly of our behavior as consumers). My amusement, however, came from my realization that while we thought alike on many important things (like our shared love of the Montblanc Ernest Hemingway, a pen considered a “holy grail” by many collectors), we differed in a few basic respects, particularly my greater willingness to take risks, to navigate the choppy waters of eBay to fish for rare species of vintage pens. But then, of course, I’m a poker player, so am more comfortable with taking calculated risks (and losing as well, because of over-optimistic calculations). My collection contains mostly vintage Parkers and modern Montblancs, so I found myself asking, what makes consumers favor one over the other? The risks in buying, say, a 1928 Parker Duofold vs. a brand-new Parker Premier seem obvious. 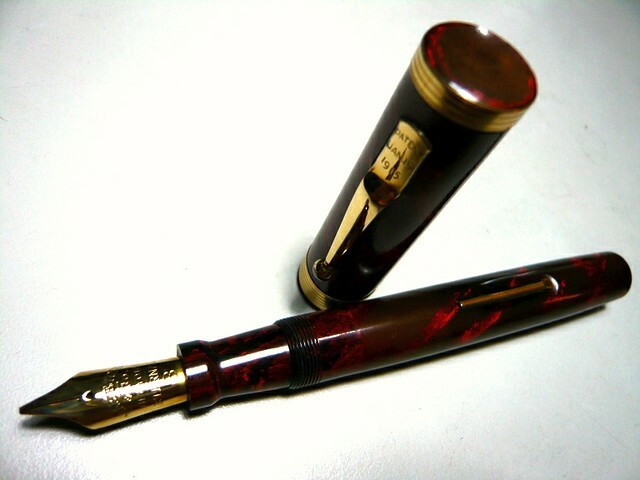 The modern pen should be shiny and trouble-free, and if it shows any problems or defects will be replaced under warranty. 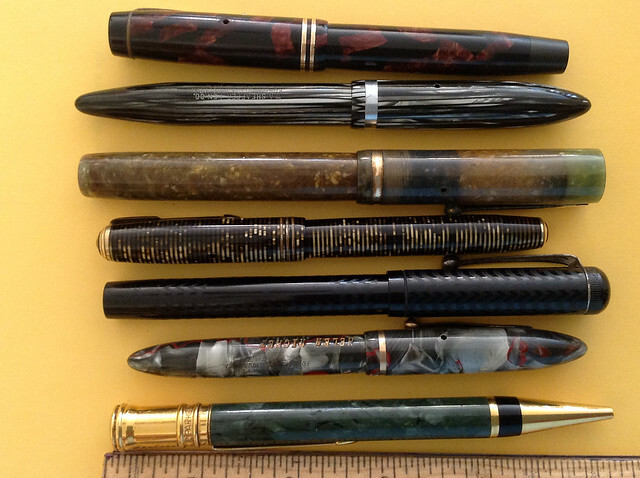 Being older than your grandfather, a vintage pen could be broken, leaky, warped, or missing parts, or otherwise difficult to operate, maintain, and repair. So why do vintage buyers and collectors seem more willing to take more risks, and even court them? One trade-off is a generally lower cost. If the items work or if you can make them work, then they will likely be well worth their price. But there are also unquantifiable values to be added to vintage objects, values that help account for their allure: the cachet of age and relative scarcity or even rarity, the history of the object itself and its provenance, and materials and workmanship you won’t find on the modern factory floor. Indeed this ratio of risk to reward forms a great part of the thrill and satisfaction of vintage acquisition. While buying a new car from a dealership can be pleasurable, it’s hard to equal the excitement of finding, say, a 1952 Volkswagen Hebmuller tucked away in an old garage. While these two buyers will likely be two different people buying for different motives, many collectors will weigh both options, anticipating and investing in the collectibles of the future as shrewdly as they assemble the best pieces from the past. In fact, as far as eBay is concerned, I’ve probably had 1,000 transactions on eBay these past 19 years, and in the two or three times I’ve had to avail myself of its money-back guarantee, it worked without a hitch. This leaves just the risk of being disappointed and of being inconvenienced by the refund process. Knowing this, the knowledgeable eBay buyer can take even more risks with the pen itself—that poorly photographed Vacumatic could be a sought-after Oversize, and therefore worth paying $50 more for. 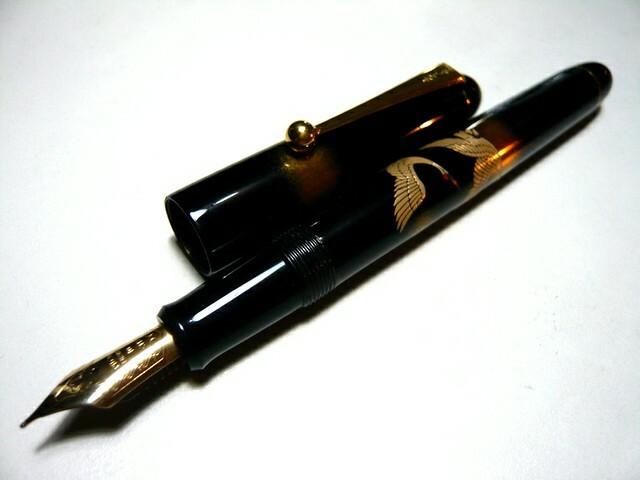 While the eBay guarantee will not refund the buyer in case the pen turns out not to be the desired Oversize (if it wasn’t advertised as such), it can give the buyer an extra boost of confidence to make a purchase, any purchase, in the way that gamblers may tend to play more aggressively in comfortable and well-secured casinos. So yes, there are indeed more risks involved in buying vintage, and buying online; but the rewards, both physical and psychic, are also potentially great, and as Dr. Deans emphasized in his talk, when the buyer perceives value exceeding price, a purchase will be most likely happen, to the dismay of our bank accounts and hapless partners. FOR THE past few weeks, these two pens have held pride of place in my shirt pocket—a Parker Duofold Centennial and a Conway Stewart Churchill. And yes, they write as gorgeously as they look!